When Burdock the barn cat sneaks into the Baxters’ farmhouse kitchen to hide behind a warm stove, he overhears a sinister plot that endangers all the animals on the farm. It’s up to him and his cohorts to figure out how to bust out of the barn before it's too late. Readers will fall in love with the solitary cat, the self-effacing cow, the unstoppable pig, even a wayward she-owl—all brought to life with clever dialogue, poetic descriptions, and expressive black-and-white illustrations. Rebecca Bond grew up in the tiny village of Peacham in northeastern Vermont. A gifted author-illustrator, her writing was full of warmth and a keen understanding of children; her artwork was distinguished by graceful watercolors and joyful, kinetic pen-and-ink illustrations. 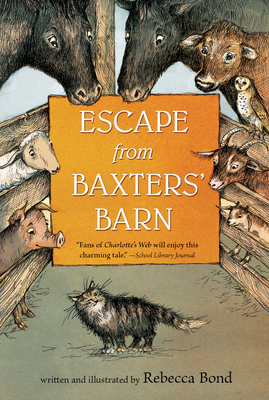 She was the creator of several picture books and one chapter book, Escape from Baxter’s Barn. "This sweet story with a serendipitous ending has a comforting, classic feel...Fans of Charlotte's Web and other gentle animal stories will enjoy this charming tale." "The book offers an opportunity for young readers to increase their vocabulary, especially if read with parents or older siblings...The story is filled with clear lessons about the danger of jumping to conclusions, the joys of teamwork, and the importance of accepting one another's differences." "In the tradition of Garth Williams's pen-and-ink barnyard images, Bond's energetically sketched b&w illustrations illuminate the animals' distinct dispositions as well as their communal courage and devotion."